A fun and unique pocket-size coloring book designed to channel stress into relaxing, creative accomplishments. Reinforced binding with strong glue allows you to open and lay this book flat to color with intricate detail without breaking the spine. In today’s busy world, finding a moment of peace and calm can be a challenge. Mindful coloring is a simple yet powerful practice that combines the proven, time-honored tradition of thoughtful meditation with the growing popularity of adult coloring books, and shows that any activity, done right, can be an exercise in mindfulness. Perfectly sized to fit into a pocket or handbag, and printed on high-quality paper that will ensure hours of bliss, The Mindfulness Coloring Book is ready to help you de-stress wherever you go. So take a few minutes out of your hectic schedule to reset and refresh with mindful coloring—and relive the days when your biggest concern was staying within the lines! 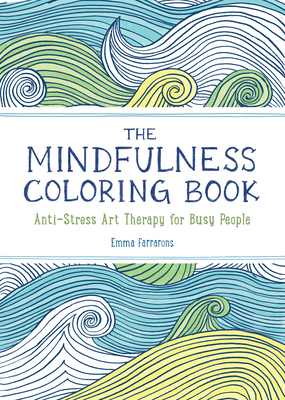 Emma Farrarons, a French illustrator and graphic designer, is the author of the Mindfulness Coloring series. Born on the island of Cebu in the Philippines, Emma grew up in Paris. She was trained in illustration at the Edinburgh College of Art and l’École nationale supérieure des Arts Décoratifs. Having completed a textile and printmaking course at Capellagården school in Sweden, she has developed a particular love for pattern and fabric print and is inspired by French, Scandinavian, and Japanese design. She illustrates and designs books, posters, and stationery. When she is not drawing and designing, Emma enjoys cooking, sewing, travel, and practicing mindfulness. She lives in London with her Danish husband.